How many action cameras do you need on the water? You see them speeding over waterways every day — action cameras. They’re the all-seeing, wide-angle eyes of the internet, and they’re no fleeting fad; they’re here to stay. The rise of affordable and waterproof high definition cameras has helped angler-made fishing film festivals proliferate across the nation. Serious anglers are snatching action cameras up in droves. Professional anglers view them as required equipment. But are consumers buying enough of them? To find out, we looked to the border, in the deepest heart of Texas—San Antonio— where CarecoTV President Wade Middleton lives. If you ask Middleton, the answer is “no.” To shoot quality video, you need quality camera angles. Angles, as in…more than one. When he’s not on the water or in the field, Middleton is busy creating television shows for networks like NBC Sports, Pursuit Channel, WildTV and FOX Sports — operations with a higher bar for excellence than your average YouTube channel. Middleton knows his way around a camera, and not surprisingly, he knows the best way for serious action junkies to rig a boat up for video. Hint: it’s not quite as simple as sticking a mount to the front of your windscreen. While it’s easy to slap a single camera anywhere on board, many anglers don’t bother to go the extra mile and purchase more than one device. Those who are serious about creating high quality fishing videos should. At any given time, Middleton runs a minimum of three Garmin VIRB’s, and it’s not uncommon to see up to six running simultaneously on board the 21-foot CarecoTV/Cabela’s Ranger. Aside from the standard windshield mount, the crew also mounts cameras on top of the trolling motor, mid-way down the port and starboard gunnels, atop the outboard motor and attached to two Power-Poles. All save the Power-Pole mounts, which regularly find themselves submerged, are hard-wired to the boat’s electrical system. Middleton says this eliminates the need to constantly swap batteries and also provides re-charging stations for the battery-operated VIRB atop each PowerPole. 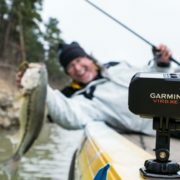 The setup will work with most action cameras, as long as the mounts are strong enough to handle the vibration when making long, bumpy runs across the water, but Garmin provides the only system with built-in G-Metrix that can display data like heart rate, speed, GPS location, and water depth (like the kind seen in Middleton’s video below) at the moment. The results of Middleton’s labor are some of the highest quality outdoor videos around. And his methods can give anglers an edge if they’re looking to enter the next local fishing film festival. For anglers with an itch to share their adventures with the world, it’s all about capturing the moment. The more moments you capture, the more film you have. The more angles you have, the more exciting the moment … and for retailers, all of those moments should add up to more camera sales. So how do you promote those sales? Tell anglers why they might want to invest in multiple cameras instead of just one. “One is a great place to start,” you might say. Explain how they can rig their boat (like Middleton) to mount more than one camera at a time. Encourage them to enter in your store’s very own customer film festival this summer.